British Blue genetics have been on winning form at two Harrison & Hetherington venues. Firstly, at Kirkby Stephen, at the annual Kirkby Classic Prize Show & Sale on 11th March. 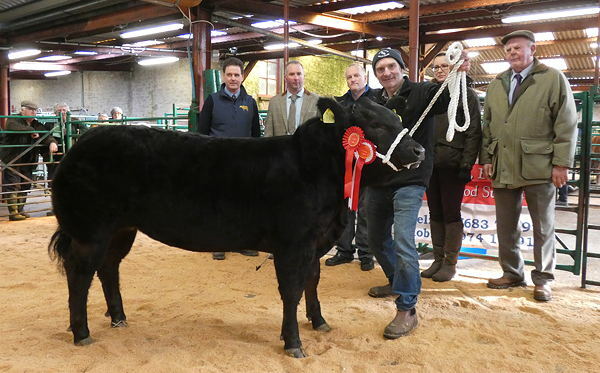 Topping the sale at £3400 was a black Limousin cross heifer offered by John Smith-Jackson of Haltwhistle. This eye catching heifer was sired by the registered Limousin bull, Shire Apollo and out of a British Blue cross cow by Bluegrass Cyclone. 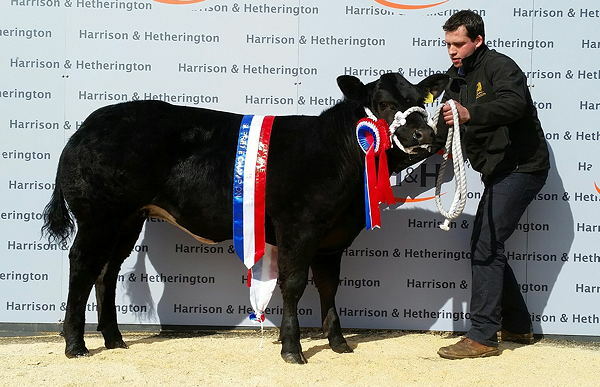 The Show Champion, judged by Andrew Dickinson, Ashbourne, was a British Blue cross heifer, again from John Smith-Jackson, with an 11 month old black heifer sired by Tweeddale Guinness. She later sold for £3200 with the judge backing his judgment and successful purchasing the heifer. Judging the show, Mr James May, Bromsgrove chose as his overall champion, from first time vendors Messrs Robertson, Newton of Logierait, Pitlochry with their homebred black British Blue cross entry. Sired by Strathbogie Kansas and out of a Craigatoke Butch sired Limousin cow, she went on to match the centre record of £8000 when selling to Mr G Small, N. Ireland and Mr B Duffton, Huntly.